When Napoleon Bonaparte escaped from Elba in late February 1815, it took this news less than a fortnight to reach the Dutch government. Without any hesitance a field army was raised of ultimately 30,000 men strong, even before the gathered politicians and generals at the Congress of Vienna reacted. The Dutch government realised its very existance as a new young state in the Europe of tomorrow was at stake, and it had to defend it recently acquired territories in Belgium. This history explores the unique strategic and tactical history of the Dutch-Belgian field army from mid-March 1815, as it became part of the Anglo-Allied army of the Duke of Wellington. This volume ends with the final days leading up to the outbreak of war in June 1815. The most detailed account is presented on the fighting in the late afternoon of 15 June at the village of Frasnes, just south of Quatre Bras, when a brigade of Nassau soldiers in pay of the Dutch army together with a horse battery stopped the French advance. You have never seen this much of detail from officers and soldiers on both opposing sides for the fighting at Franses, when we present to you their own private accounts. On the morning of 16 June 1815 the troops of the Netherlands army face a force of the French army at the crossroads of Quatre Bras. What are they to do against such an overwhelming French presence? Can the Dutch generals be sure the major thrust of Napoleon is targeted against them? Can they meanwhile execute the orders from the Duke of Wellington to concentrate around the town of Nivelles? This volume concentrates on the events of the Dutch-Belgian forces involved in the Battle of Quatre Bras. How they were able to withhold an enemy three times larger than their own in the initial hours of the battle, before any reinforcements arrived. This is the history of the opening hours of Quatre Bras you never read about! This volume provides you every little detail on the Netherlands forces, when they took part in the retreat on 17 June from the fields of Quatre Bras and next took part in the Battle of Waterloo on 18 June 1815. No other history has ever presented the case of the Dutch-Belgians in so minute detail before. Every true afficionado on the Waterloo campaign and this battle that determinded the future of Europe, must read this history. All the details of the involvement of the Dutch-Belgians at Waterloo are explained in full detail, with numerous private accounts from veterans. Volume Four is planned for publication in 2019. Volume Four presents the the role played by the Netherlands field army, as part of the Anglo-Allied and Prussian armies during the invasion of France after Napoleons defeat at Waterloo. 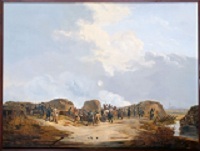 The military forces of the Netherlands army were devided into two forces, one observing and besieging various French fortress towns in the north of France, to ensure vital communications, and another force that marched rigth up to Paris and ensured a military presence to force France to sue for peace. This history presents the final and often neglected part of the 1815 campaign from the Dutch-Belgian perspective.